From ESL warm-up games and classroom management techniques to second language acquisition and teaching English grammar, our 100-hour course covers a comprehensive range of teaching skills ensuring our graduates are well-trained, marketable ESL teachers. The first day of the course introduces teaching strategies and practices for effectively delivering content and material in an engaging, understandable, and memorable manner. Warm-up games and exercises are valuable lesson components to engage students, and icebreaker activities help bring them together as a class to reduce shyness and inhibitions. The characteristics of effective teachers and learners are introduced, as well as strategies for meeting the needs of diverse learners in the classroom. The second day of the course covers the latest educational and language acquisition theories, in addition to the cultural and adaptive aspects of living and teaching in a new culture. ESL teachers abroad are often asked to teach across several proficiency levels, and many teach students of a wide range of ages, from children and adolescents to adults. These examples of diverse learners require special attention when teachers plan lessons. Approaches, techniques, and lesson planning strategies for teaching across age and proficiency levels are covered. The third day of the course focuses on how to teach speaking, listening, reading, grammar, and vocabulary skills to ESL students. Phonemic awareness, pace, stress, and accent are all important speaking and listening skills that are covered. As grammar is often an area of concern for many new ESL teachers, we pay special attention to the structure and format of the language, both as a refresher for teachers and as an introduction to grammar teaching. Suggestions for creating interesting and effective communicative lessons are introduced and discussed, and sample lessons for each language skill are explored in detail. The fourth day of the course covers intelligence and learning theories as well as continuing with the specific ESL skills taught on Day 3. Multiple Intelligence Theory is covered in detail along with suggestions for creating language lessons that appeal to diverse intelligences. Sample lessons for teaching writing and pronunciation are covered and discussed. Expressions, slang, and idioms are difficult language skills to master, so tips for teaching these skills are covered in Day 4, as are organizational skills to assist teachers in maintaining an effective learning environment in a culturally diverse classroom. The fifth day of the course delves into the process of finding an ESL teaching position abroad. Résumé writing and interview skills can be different for ESL jobs than for other forms of employment, so strategies for creating effective résumés and tips for presenting oneself well in interviews for ESL positions are covered. Once an ESL teaching position is secured, teachers living abroad must adapt to living in a new culture. As culture shock is a part of every overseas teaching experience, tips and strategies for recognizing and adapting to it are discussed; as well as suggestions for preparation before travelling abroad. The sixth day of the course allows students to put what they have learned into practice. Each student must create and deliver an effective and engaging ESL lesson. Our experienced instructors will give detailed feedback on the lesson and delivery. There are a wide range of ESL textbooks and resources available for use in ESL classrooms; criteria for identifying and evaluating quality resources and suggestions for where to find them are discussed on the sixth day. Time is also set aside to wrap-up the course and answer any questions about teaching and living abroad. 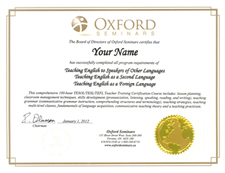 The online component builds upon the practice and theories developed during the in-class portion of the Oxford Seminars certification course. Further developing these themes, the 100-question online assignment will cover the role of the teacher within a communicative language classroom, along with practical considerations for effective and engaging lesson planning. The fundamentals of language acquisition, learning, and teaching are explored through case study analysis and an in-depth look at ESL theories and concepts. Grammar is the backbone of language; it provides the framework for communicative exchange. The online component delves into simple and complex grammatical structures, the twelve tenses of the English language, the parts of speech, as well as common grammatical errors and misconceptions. Through a critical evaluation of grammar resources and lessons, teachers will hone their understanding of English grammar and how to teach it through stimulating and engaging lessons, with a focus on the role of grammar in facilitating communication. The 100-question online assignment covers a wide range of teaching theory and is designed to promote continued learning and deeper understanding of English grammar and ESL teaching. Available exclusively to Oxford Seminars graduates at no additional cost, our Graduate Placement Service provides assistance with ﬁnding the most rewarding teaching jobs at ESL schools around the world. Upon completing our TESOL/TESL/TEFL certification course, students become eligible to take up to three Specialization Modules. Please Note: TESOL, TESL, and TEFL are widely interchangeable terms which essentially mean the same thing. Each of these terms is most commonly used in a different part of the world. At the end of our course, graduates receive a combined TESOL/TESL/TEFL certificate which is recognized and accepted around the world (and which includes all components of TESOL, TESL and TEFL teacher training).